Whether you are spending time at the beach, hanging out at the pool, or simply taking a walk in the park, your skin is exposed to sunlight’s ultraviolet (UV) rays. While many of us enjoy bathing ourselves in warmth and sunlight, exposure to UV rays leads to changes in the skin, and overexposure can result in the redness, pain, itching, blistering, and peeling associated with sunburn. But why does the skin soak up sunlight and inflame? What causes this redness and pain? Our skin affords us with a natural defense mechanism from UV rays, but it does not always protect us from their damaging effects. When the defense system is overwhelmed, we get sunburned. UV light is a wavelength of sunlight that is invisible to the human eye. UV light carries a lot of energy, which causes a cascade of events when it hits our skin. These processes can damage the DNA in our skin’s cells by breaking apart the molecules that are important for their function. 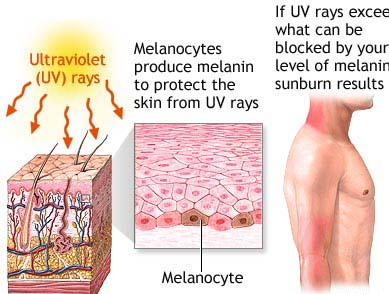 Melanin is a small structure that works to protect our DNA by absorbing the energy in UV light. When melanin fails to absorb this energy, usually due to overexposure of sunlight, the energy can damage the cell’s DNA. Once DNA is damaged, the cell can no longer function and it is destroyed. When the body senses the destruction of the cells, it immediately starts flooding the inflamed area with blood. This is why your body becomes red when sunburned. Generally speaking, therefore, the main cause of sunburn is the sun and its UV rays. However, there are several things that can speed up and increase the likelihood of sunburn. Mobile devices. According to a study by Logue and Zlotoff (2015), mobile devices can increase UV exposure by as much as 85% due to their reflective nature, especially laptops and iPads. This means that if a person is sitting in the sun and using a device at the same time, they are more likely to get sunburned. Unless you are using a device that is created to be less reflective, you should avoid using it when exposed to sun. Alcohol. Excessive alcohol intake also increases the severity of sunburn. Heavy drinkers have a much higher risk of getting sunburn than those that drink occasionally, and it can lead to additional dehydration. Autoimmune diseases. Autoimmune diseases such as Crohn’s disease and rheumatoid arthritis can make the skin more sensitive to the sun. Both sunburn and skin cancer are more commonly found in people who suffer from autoimmune diseases. Monthly skin examination is highly recommended for these individuals. Medications. Some medications can also increase sun sensitivity and cause the skin to burn faster. These include antibiotics, diuretics, and topical and oral retinoids such as acitretin, tazarotene, isotretinoin and tretinoin. Additionally, there are many medications that can cause unwanted reactions to the sun, including over the counter pain relievers, antidepressants, and oral contraceptives. Poor quality or expired sunscreen. Sunscreen will not provide the protection you need if it is poor quality or outdated. Sunscreen cannot maintain its original strength after a long period of time. Even if it’s not yet past the expiration date, it’s recommended that sunscreen should not be used if it was produced more than three years ago. Lack of protective clothing. Regular t-shirts do not provide adequate protection. Many assume that all clothing protects from UV rays, but UV rays can penetrate most fabrics. A typical t-shirt, for example, provides only 7 SPF. Even if you are wearing a t-shirt, it’s important to take additional protective measures. Clothing can purchased that is designed to keep out UV rays, and this is a great option if you plan to be in strong sunlight. The sun can do a lot of damage to the skin. It’s important prevent the inflammation, itching, peeling and pain caused by skin cell damage and death. Using good sunscreen, wearing protective clothing, and wearing sunglasses and a hat are the best way to get UV light protection if you have to get out in the sun while its at its strongest. After all, overexposure to the sun can cause serious complications and disease if not protected against.